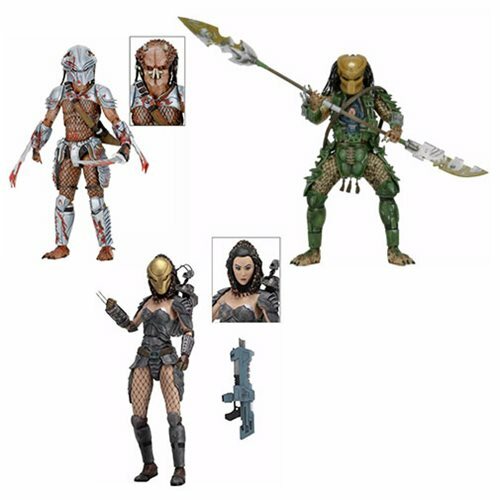 NECA's longest running action figure line continues with an entire series dedicated to Dark Horse Comics Predators! Series 18 features three action figure debuts that are some of the most requested by fans: Hornhead, Broken Tusk and a first female Predator, Machiko! Each action figure has between 25 and 30 points of articulation! Machiko stands about 6 1/2-inches tall, while Hornhead and Broken Tusk each stand about 8-inches tall. Machiko and Hornhead come with removable masks! Broken Tusk and Hornhead utilize the Ultimate Predator body. Ages 17 and up. Hornhead made his first appearance in Predator: Life & Death, and is a great companion piece to the Ultimate Ahab Predator, also from the comics. He utilizes the Ultimate Predator body, and comes with a removable mask and sword accessory that fits in a sheath on his back. Broken Tusk originates in the classic 1990s Aliens vs Predator comics, and his epic story arc also includes Machiko Noguchi, a human colonist who performs the incredible feat of earning his respect and joining his tribe. Broken Tusk utilizes the Ultimate Predator body and comes with gun and bladed weapon that measures over 12-inches in length! Machiko has a removable mask, extra interchangeable hands, and rifle accessory.